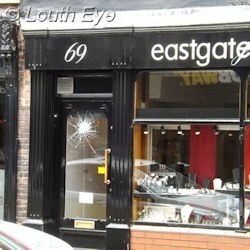 An Eastgate jewellers was the target of an attempted armed robbery at around lunchtime on Monday, 24th June. Sirens could be heard in coming from Queen Street car park as the police attempted to track and arrest the suspects. The area around Eastgate jewellers was cordoned off, whilst police interviewed eyewitnesses. 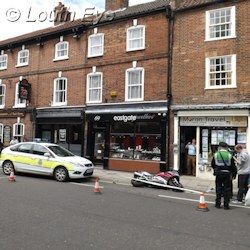 "One suspect from Louth jewellers run towards Kidgate, through school to Newmarket. Distinctive white and black trainers, poss grey jacket." "Louth offenders wore motorbike helmets. Discarded helmet found near London Rd sports ground and cemetery." "Louth suspect may be wearing tracksuit bottoms over jeans. 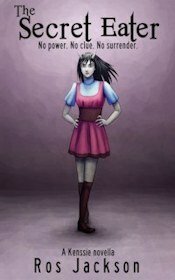 Call us if you find discarded clothing or see anyone dressed like that." There was a significant police presence in town following the incident. A police helicopter from Humberside police force hovered over Kidgate and Ashley Road in an attempt to locate one suspect. Police have reported that one suspect was arrested after the incident, but another one remains at large. They believe the second suspect has a knife, and have warned the public not to approach him. The police have said they have arrested a second suspect, and are not looking for anyone else. 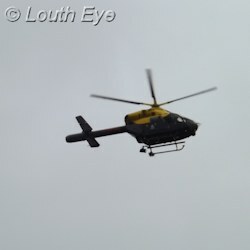 In the Louth Area Committee meeting Inspector Terry Ball praised the public for their co-operation. "No-one obstructed, and everyone assisted us," he said, adding that letters of thanks would be sent out to individuals for their assistance. In describing the crime, he said "a significant amount of force was used." An area in the centre of Louth is blighted by arson.